DIY dog grooming not only saves you money… it also gives you that certain rewarding feeling. And, as I’ve mentioned before, it helps you bond even closer with your pet. It can sure feel confusing, though. What often puzzles people are clipper combs for dogs, how they exactly work, and how they compare to dog clipper blades. Let’s clarify things a bit, shall we? I’ll focus on the most convenient clipper combs. That would be the snap on type, with this Andis’ set from Amazon.com being their best representative. When is it better to use dog grooming combs? Snap on combs (sometimes referred as dog clipper guards too) are generally a safer approach to controlling the length of your pet’s hair. If you’re a total beginner, a DIY grooming session with your pooch might make you feel anxious. What if you hurt your dog? That’s why some people tend to steer away from cutting dog hair with naked blades until they feel more confident. Doing freehand work on a non moving subject is tricky enough. Now trying it on a fidgety dog can be a recipe for disaster. It takes years of experience before you would feel like you could do it yourself. Clipper combs can take away all of that fear and years of messing up your dog’s fur. Snap-on combs are attached to the clipper’s blade end. This means they “soften” the cutting edge with their plastic. Even if your hand slips or your technique isn’t that great, you shouldn’t be able to poke your pet and hurt them. In this sense, attachment guards are a beginner-friendly starting point to proper pet grooming. You would also want to use snap-on combs when you want to leave more hair on your dog’s body. It’s no secret naked blades cut quite close to the skin which might be too much for some breeds. I can’t know what breed your dog is, but in some cases, going with snap-on combs is the better choice even if you’re a pro DIY groomer. Are all snap on combs the same? Not really. I mean, the top 3 brands – Oster, Andis and Wahl, all have their snap combs for pro dog grooming tools. Where things get different is the material they’re made of. Andis pet grooming comb attachments from Amazon.com are the most diverse bunch. You have the standard plastic combs, but you can also get chrome or stainless steel snap on sets. Honestly, if you have the opportunity, I recommend always picking the steel clipper combs for dogs. They attach more securely to the blade which means they won’t slip/move while you’re grooming your dog. This allows for more comfortable, more precise grooming sessions. Keep in mind that combs can be used across clipper brands! So for example, Wahl’s set can be used over Andis’ pet clipper blades. Andis recommend using snap on combs on their #10 size blade, while Wahl recommends using their #30 size blade for optimum results. The main thing to look for is a sturdy construction. If the combs are prone to bending when faced with a lot of thick fur, then you’re going to end up with an uneven cut. Then you’re forced to keep going over the same spot. When time is of the essence as your dog only has so much patience before he starts to get antsy, then you want to make sure your tools help you work quickly and efficiently. I like Andis clipper guards as I feel they have a very sturdy construction. It is not easy to groom your dogs hair if you have not had the proper training. In fact, most people don’t even have the proper tools, nevermind the know how. Any tools you can use to make it easier to give your pooch a good looking fur cut is something indispensable. The only downside to these clipper combs for dog clippers is that they may not leave the fur as long as you’d like to keep it. In which case you will have to learn to freehand cut. 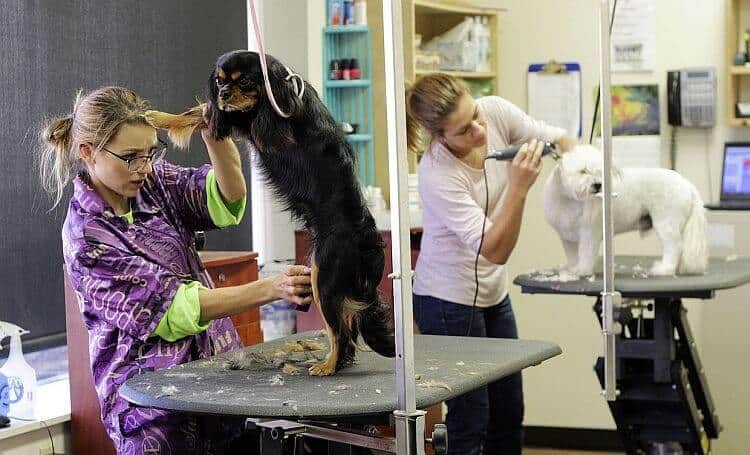 For short haired dogs, I wouldn’t attempt a cut without using guards unless I had a lot of experience. Do you have any questions about clipper guards? Want to know which ones will fit your model of clipper? Simply drop us a comment in the box below and we will get back to you as soon as we can! There are some limitations to clipper combs for dogs. First, using them over blades that leave hair shorter is your best option. That would be #30 or #40 blades, leaving hair at 1/50″ or 1/100″ respectively. Most clippers come with a #10 blade (1/16″.) Snap on combs perform somewhat okay with a #10 blade or lower, but they aren’t the most optimal solution. At that point, just going with naked blades is a better option. Also, let’s get this clear: clipper combs and their attachments have nothing on pure blades on breeds with thicker hair. If your dog has matted hair, you not only want to have the proper clippers for that. You also want to skip on the snap on combs, because they’ll just get stuck in the tangles. Even the sturdier steel combs can’t take on matted hair with good results. You’ll be left frustrated with a pooch that’s not properly groomed at all. Combs aren’t that great for sanitary areas either. I know you might be scared about poking around there, but sanitary and intimate areas are best kept quite short. Dog guards will keep in your way in this case. Our Panasonic ER430K Review | Is It The Best Nose Trimmer? The brand of clipper I have is Ceewes, it has plastic guard combs marked 3mm, mm, 9mm, and 12mm. I have no idea which to use, and there are no grooming instructions with the item. I have a Maltipoo with soft, fine hair that has recently changed from straight/wavy to wavy/curly and I want it short so he looks more poodle-ish and less Maltese-ish. Which guard should I use? Thank you for the demonstration! I really appreciated learning how to put the comb attachment on. I was beginning to think the Oster attachments were too small for my Oster clippers! Very appreciative! Hi, I what to use comb attachments for my Yorkies heads and face to thin then out a bit but don’t know which length to attach to my No10 blade. I have andis 2 speed clippers, I cut my yorkies bodies with a No7f blade as I like them short. I do trim my yorkies head and face with scissors but one of my yorkies has really think fur. I have a very small yorkshire terrier puppy that needs a bit of tidying up. As she’s terrified of a full-size trimmer for grooming, the vet recommended the mini “Shear Magic battery trimmer”. 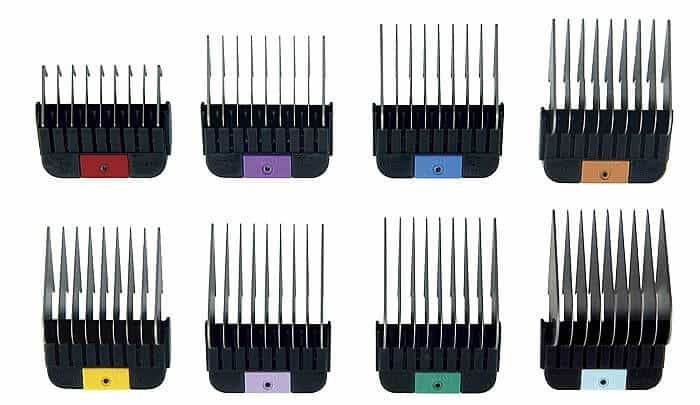 Do you have or know of some small comb attachements I can buy for it? Can you tell me what I am doing wrong? When I use combs on my 30 blade, I find that hair gets caught in the comb and blade, what is wrong? Thanks for your help. Hi Jerry, thanks for the question. With a #10 blade if you want to leave the fur at 1.5 inches then try the Wahl clipper guards and use the green one. That is specific for the #10 blade and that length. Unfortunately the Andis ones that are meant for the #10 won’t leave you with that length. The longest you can get with those is an inch.